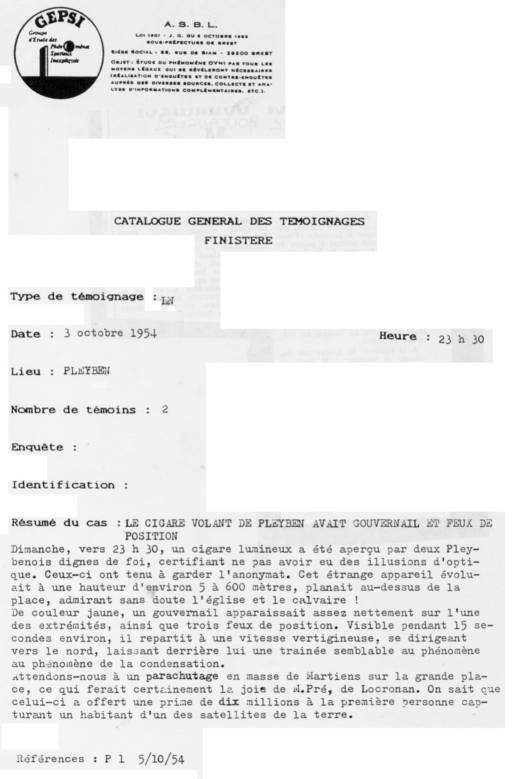 Reference number for this case: 3-Oct-54-Pleyben. Thank you for including this reference number in any correspondence with me regarding this case. Sunday, at about 11:30 p.m., a luminous cigar was seen by two ressidents of Pleyben worthy of faith, certifying not to have had optical illusions. They made a point of keeping anonymity. This strange apparatus evolved at a height of approximately 5 to 600 meters, hovering above the place, undoubtedly admiring the church and the martyrdom! Of yellow color, a rudder appeared rather clearly on one of the ends, as well as three navigation lights. Visible during 15 seconds approximately, it set out again at a vertiginous speed, moving towards the north, leaving behind itself a trails similar to the phenomenon of condensation. Let's wait for a mass parachuting of Martians on the main square, that would certainly cause the happiness of Mr. Pré, of Locronan. It is known that the latter offered a premium of ten million francs to the first person capturing an inhabitant of one of the satellites of the earth. [ge1] File, GEPSI ufology group, the Finistère, France.